This smoothie is scrumptious, sustainable, and wonderfully waist-slimming. I have it for breakfast most days, and sometimes I will have it in place of a meal (if I didn’t have it for breakfast that day). Of course, everyone is perfect the way they are, but I do understand the want to lose an extra few pounds. I have been on quite a journey in the past few months. Over the past two or so years I was not in the best place, and I am a stress-eater. So, long story short, over the course of two years I gained almost 50 pounds. Now, I was still fairly healthy, but overall I really just wanted to feel better in my skin and feel healthier as well! So, to really incorporate this into my life I started to eat better, and exercise more. This smoothie really helped me to eat healthy! Over the past 2-3 months I have lost over 20 pounds!!!! Without further ado, this is how I make my all-time favorite smoothie for weight loss! The first step to creating your own ultimate breakfast smoothie is to add some fruit. I chose mostly strawberries with a few mixed berries (blueberries, raspberries, blackberries) in to add some other flavors. 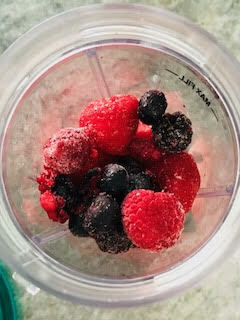 I prefer to use frozen fruit, because that way I do not have to add any ice. As you can see, I filled the cup to just below the fill line with berries. The next step to the smoothie-making is to add protein powder. This is optional, but it definitely adds nutritional value. I use a vanilla powder so that I get both the protein and the sweetness from the vanilla added into my smoothie. In the past, I have also used banana powder and I really enjoyed it!! Seeds? Yes, seeds. Chia seeds and flax seeds are great sources of fiber, which helps you to feel full. Flax seeds have Omega-3 Fatty Acids in them, which can help raise good cholesterol, helping to prevent heart attacks. Chia seeds have tons of antioxidants, and they are a great source of fiber, iron, and calcium! I use two tablespoons of flax seeds (left) and one tablespoon of chia seeds (right) in my smoothies. Now, i’m sure just about everyone knows that putting greens in your smoothie is a great way to integrate them into your diet. However, not everyone has greens on hand all the time due to their quick expiration date. When I do not have spinach (my favorite green to put into a smoothie) on hand, I use this powder called supergreens. It is a mixture of about 60 different healthy fruits and vegetables. 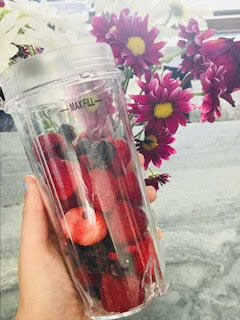 Plus, is has a berry flavor, which goes perfectly with the taste I am going for with this smoothie! The final ingredient to our healthy smoothie is a liquid! I chose to use Silk Unsweetened Light Vanilla Almond Milk, as I do not drink regular milk. If you would prefer, you can use regular milk or water as well! Of course, to finish your smoothie you have to blend it! Just blend until it seems that all of the ingredients are evenly combined. Then, just pour your smoothie into a clean glass, wash your blender, and all that’s left to do is enjoy!